A popular choice for interior applications, the V370 vertical post box can accommodate high volumes of mail and large A4 size documents with ease. Fully compliant with the Homes Guide 2016 Secured by Design initiative and EN13724, it is well-suited to mixed-use buildings and multiple-occupancy tower block accommodations. Total capacity 13.43 litres. Dimensions: 370 x 330 x 110mm (width, height, depth). 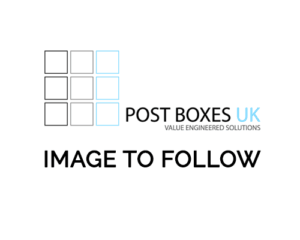 The Post Boxes UK integrated service is recommended for property owners and developers who are looking to install a fully functional mailbox bank. We can install any number of V370 vertical letter boxes, the only limit being the amount of installation space available. The V370 multi-occupancy post box can be wall-mounted and wall recessed, or if a less permanent option is preferred for rented accommodations, they can be left as a freestanding unit with support legs. 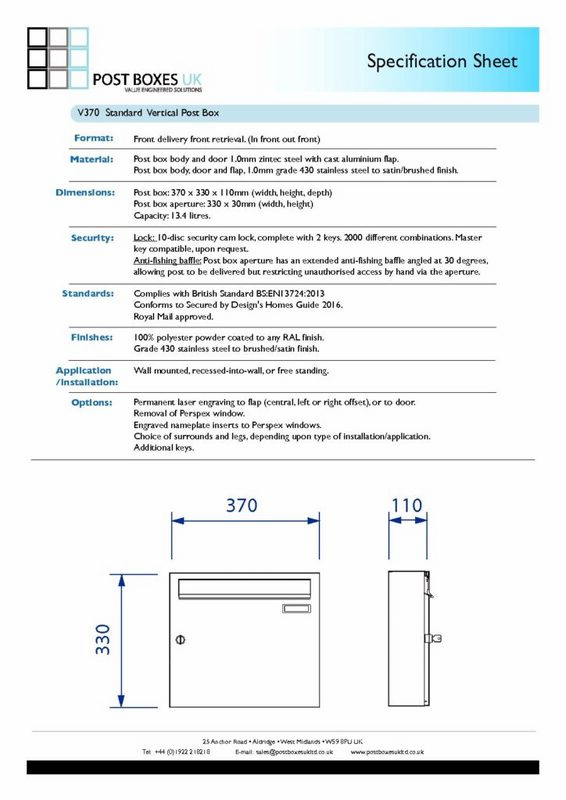 The V370 secure mailbox can be supplied in over 200 standard RAL, non-standard RAL, and multi-RAL colours. We also offer a variety of high-end finishes such as textured, gloss copper, matt velvet black, and satin stainless steel. Class 0 flame retardant paints are available for BS476, Building Control and Fire Regulation compliance. Order your V370 mailbox banks today, and they could be delivered within our standard turnaround time of just 4 weeks. Larger projects may require a little longer to complete, but we will advise you of this when creating your project design plans. Contact us for further details. The V370 letterbox is constructed in solid steel and designed to withstand harsh weather conditions. It’s rust and corrosion resistant too, making it the ideal choice for external entrances and outdoor post bank areas. Post Boxes UK offers a variety of finishing surrounds for the V370 communal letterbox. These include picture frame style surrounds, 20mm – 40mm flange surrounds, 2mm sheet finishing surrounds (sometimes referred to as cladding), and 20mm volume surrounds. 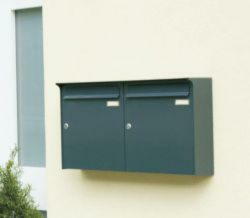 To comply with EN13724, your V370 freestanding mailbox should not exceed 1800mm FFL (finished floor level) in height. Post Boxes UK offers a number of support leg options for this popular letterbox, which can be customised to meet your requirements and height specifications. Side supports, pedestal legs, and combinations of both are available. To customise the V370 letterbox with apartment numbering, identification codes, names, business branding, or an address, please contact Post Boxes UK. We offer a comprehensive personalisation service including engraving and laser etching and have a huge choice of fonts and designs to choose from. A secure locking mechanism is essential for the V370 Secured by Design letter box. While a top-quality Eurolock Cam Lock comes as standard, Post Boxes UK offers a range of premium options for those wishing to upgrade. Master keyed suites (UMK), padlock compatible cam locks, push button digital locks, and RFID/NFC proximity locks all feature in our range, along with many others. Contact us for more details. To meet the demands of busy property developers, management companies, and reception teams, Post Boxes UK offers replacements keys for the V370 mailbox, with discounts available for bulk orders. We also offer replacement lock programmes for those wishing to upgrade their current systems. 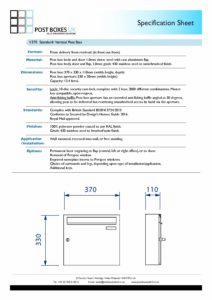 To meet current EN13724 requirements and the recommended guidelines set out in the Homes Guide 2016, the V370 Secured by Design post box is equipped with an anti-fishing device to prevent tampering and unauthorised access via the full-length aperture. An exceptional postbox for commercial and residential premises, the V370 is a high-capacity mail receptacle with impeccable attention to detail. Suitable for indoor and outdoor use, it is designed to withstand harsh UK weather conditions and equipped with the latest security features to keep would-be post thieves at bay.